Study Abroad: Gonzaga offers study abroad programs in over 40 different countries (including Gonzaga in Florence); 53% of students study abroad. More information is available at gonzaga.edu/studyabroad. 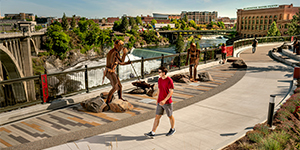 Financial Aid: 99% of Gonzaga’s students earn scholarships and/or grants. Gonzaga is ranked #6 in the West for “Best Value” and #2 in the West for “Best Graduation Rate” (U.S. News & World Report, 2019). Outcomes: 93% of graduates are working, attending grad school, or volunteering in service programs (First Destination Survey Report for 2017 grads). Student Life: The Gonzaga Student Body Association sponsors more than 100 clubs and organizations, numerous dances, ski weekends, and more. Martin Center offers a state-of-the-art fitness facility. 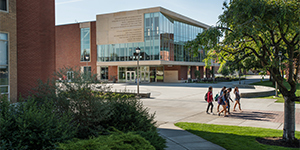 The Hemmingson Center houses food venues, a movie theater, study rooms, a reflection room, Gonzaga Outdoors, the Office of Mission and Ministry, and more. One of today’s biggest challenges is ensuring that every child receives a great education. At Gonzaga University, we’re up for the challenge. Rooted in our tradition of Jesuit Catholic and humanistic education, we educate our students for lives of leadership and service for the common good.And there’s no better place to see that mission in action than in our School of Education. Gonzaga’s School of Education will train you to become a leader in education who impacts and inspires future generations of students. We prepare socially responsive and discerning practitioners to serve their communities and professions. • We model and promote leadership, scholarship, and professional competence in multiple specializations. • We support an environment that is challenging, inclusive, reflective, and collegial. • We foster inquiry, intellectual creativity, and evidence-based decision-making to accept the challenges facing a global society. • We provide academic excellence in teaching, advising, service, and scholarship. • We promote, support, and respect diversity. Why pursue a program with Gonzaga’s School of Education? • Gonzaga’s Teacher Education program is accepted for certification in all 50 states. • Gonzaga’s School of Education mentors its students in an integrated field and course work environment. • Students receive support from faculty who are committed to their success and career goals. • Students are well prepared for licensure exams: in 2017–2018, Gonzaga students had a 98% edTPA First-Time Pass Rate.